The fire escape stairs you see in the photo is really the shadows. 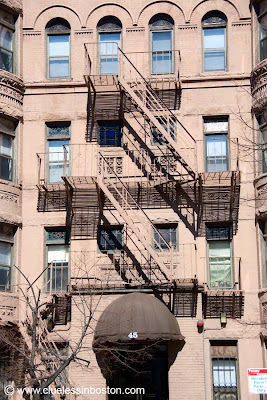 The metal fire escape stairs are painted the same color of the building and blends in so well it is almost hidden in plain sight, like an optical illusion. A much better example of a shadow optical illusion can be seen in this National Geographic photo. If I lived in Boston or NYC I'm sure I'd photograph fire escapes all day long. Just love them. this is super. Fantastic shot! Love it, and the Geographic shot, very nice.